Sizzix sent me last month a bunch of pretty new dies and all kinds of goodies. I love them to death! Among those new dies, there was one that instantly caught my eyes. I am obsessed with paper stars. They are too magical and can be used in so many home decorations. 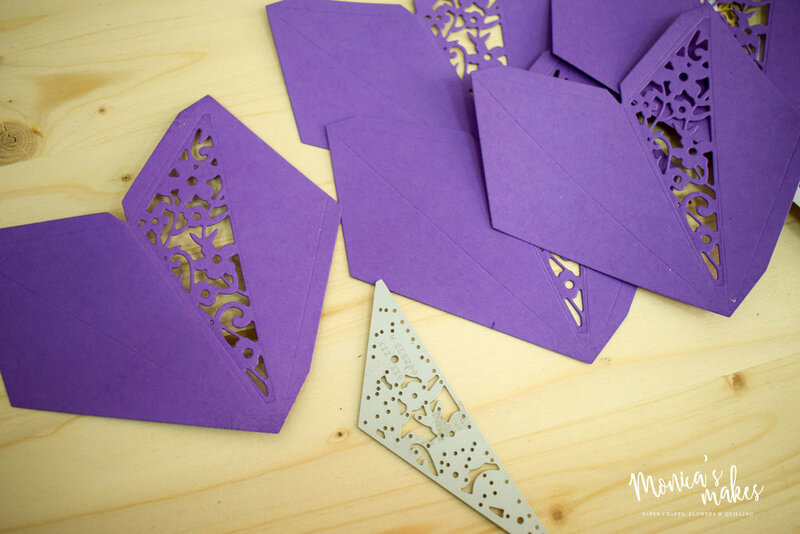 Yep, paper star garlands are one, but I’m thinking of a photo booth decor with these pretty little ones. I crafted nine purple stars in an afternoon, and was so thrilled with how cute they look I had to share them and give you the tutorial. The instructions that came with the die let the process up to you. It’s not rocket-science but I thought I’d make things easier for you with the step-by-steps to making 3D paper stars with Sizzix’s Thinlits Die for 3D Paper Stars by Sophie Guilar. Making a paper star with Sizzix is beyond easy. The pack contains two dies, one that makes the elements (rays) and one that cutouts the pattern. I made more plain stars because it was faster, but I decided to try the floral pattern and they look even cuter. Yep, I’d say uber cute. The fun part with star papers is that they are fun year-round. I plan on making a paper star garland for Christmas with these beauties and maybe use it later, with fairy lights, to light our bedroom. Magical atmosphere. 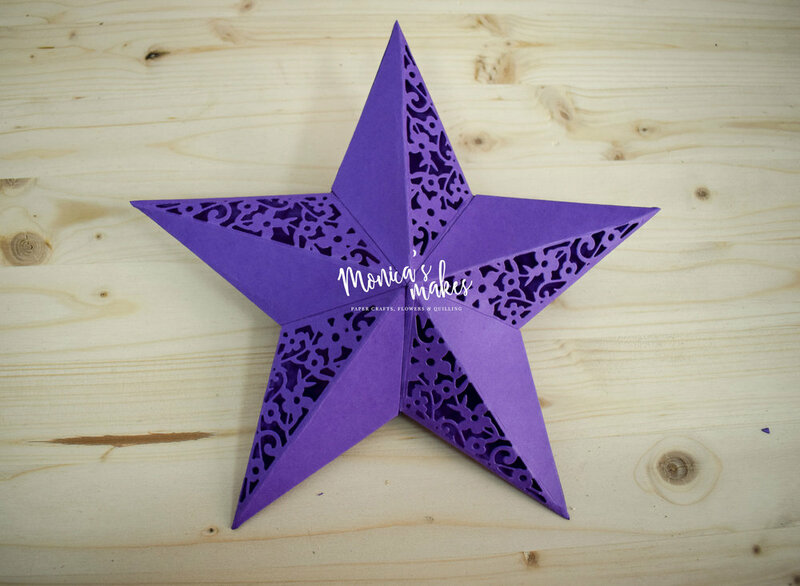 I used 2 pcs of A4 purple cardstock (240 m/g) to make a star. Might not be the first color that comes to mind when you think about stars, but I have an obsession with purple and I have a bunch of different colors already available in my studio. So, it just made sense to use purple this time. But I’m already thinking of making some glittery gold stars next time. 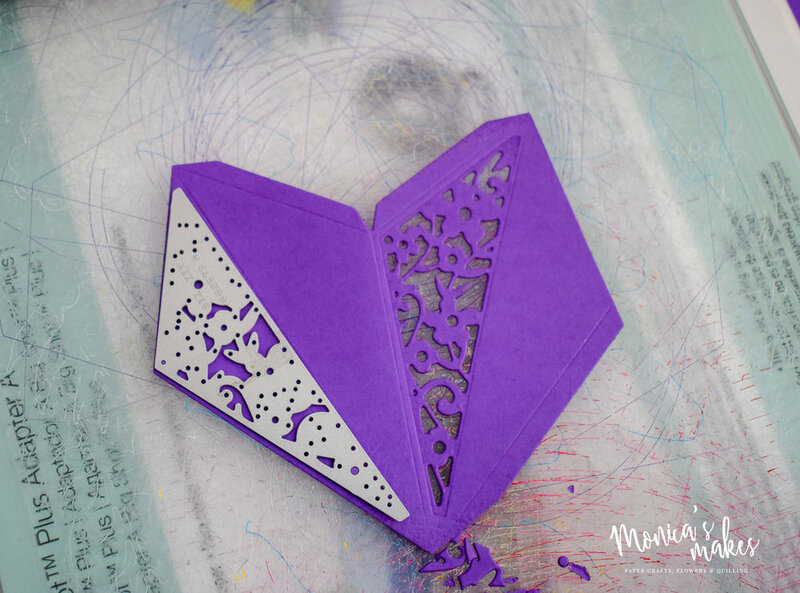 I used the 3D paper star Sizzix die with my Big Shot machine, on the multipurpose platform and the blue pad for thinlits. To bring it all together, I used glue, the mighty-all-powerful glue. What would I do without it? I placed the first plastic cutting pad, the multipurpose platform, the blue thinlits pad, paper, the large die (with the cutting part down) and then the second plastic cutting pad. I took this “sandwich” and passed it through Big Shot. I repeated the procedure 5 times to get 5 star elements. 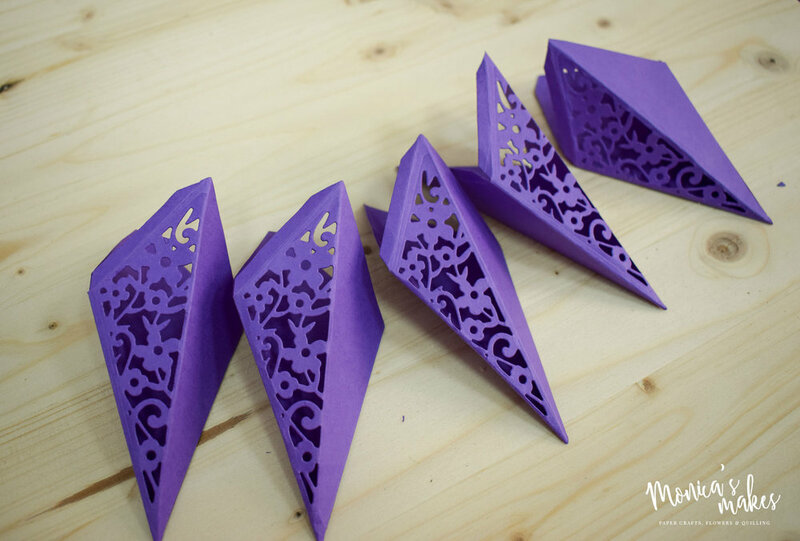 If you want, you can make your paper star without the floral pattern and can already start folding when you have the 5 elements. If you want the floral pattern, then you have to put each of the elements in Big Shot, this time with the small die on. You can use the floral pattern as much as you want. I decided to use it on one side of the star, only once for every element. But if you’re planning to use them as a garland with lights, then you could cutout the floral pattern on every part of the element. Many, many years ago, at the beginning of time… No, I joke. When I first started crafting with paper, some maybe 10 years ago, I first started with origami. And I loved it. This 3D paper star project involves a bit of folding, so it brought back so many memories of my origami projects. 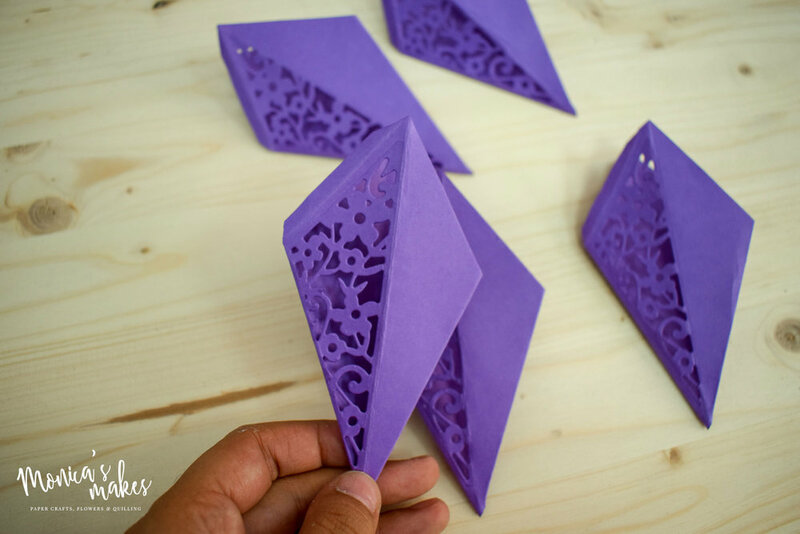 The folding part of this DIY paper project takes a while, as you have to pay attention to each fold. And if you’re using the floral pattern, then you need to bend it carefully along the marks. But it’s so fun to do. It takes maybe 10 minutes to fold each of the 5 elements. After you’re done folding all the elements, it’s time to glue them. Each of the element has 3 edges: the longer one, on the side, is glued to finish each individual element. The shorter ones will help you connect the elements between them. The process is easy, but you need to pay a bit more attention at the final step, when you have to link the final elements. It’s easier when you have a paper star with the floral pattern cutout. Thanks for reading. Hope you enjoyed this pretty paper star tutorial. Stars are too magical. Have any tips or projects you'd like to share? I'd love to hear from you so please share in the comments section below. For more DIY projects, check out the blog home page. If you want to learn when I publish a new DIY tutorial, subscribe below to get the news.